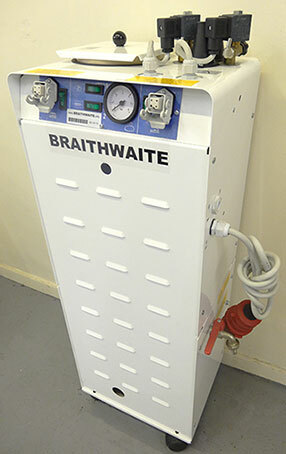 Braithwaite GAK4E self-contained steam generator for use with 1 or 2 electric hand steam irons. Designed for industrial use in the Clothing & textile industry including manufacturers, laundries, ironing Services and other allied industries. The GAK4E industrial steam generator is automatic and self monitoring. The operator fills the cold water tank and switches the unit on; then the electronically controlled water pump fills and tops-up the internal stainless steel pressurized heating chamber as needed. Cold water is added in small controlled amounts; so you don't loose pressure or temperature, allowing you to continue working with-out interruption. The top mounted solenoid values are user adjustable allowing you to control & set the flow of steam supplied to the industrial steam irons. Metal full length industrial cabinet with 4x casters. Internal stainless steel heating chamber. 4kW heating element mounted in the middle of the pressure chamber. Automatic filling 400w industrial water pump. Electronically controlled automatic water level monitor. Easy to fill Internal cold water tank. 2x User adjustable solenoid valves, allowing you to control & set the flow of steam. 2x Electrical equipment sockets. For use with up-to two industrial irons or steam guns & steaming handles. Blow down / service drain tap. Designed & manufactured in Europe to strict quality standards. Manufacturers UK service centre for supply of spares, technical support and repairs. *minimum 32amp connection unit required.